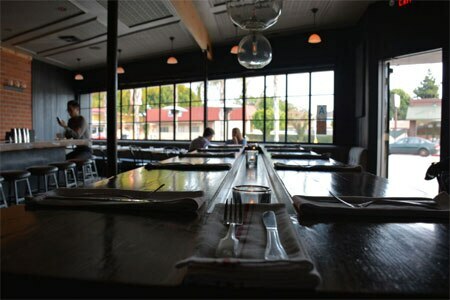 Located in Culver City, The Corner Door is yet another casual but gourmet neighborhood hangout. : Black walls, wood banquettes and high communal tables in the dark interior nestle together creating a small nook of a dining room. Though The Corner Door portrays itself as a gastropub, the menu is more a reflection of well-executed New American cuisine. Snacks include requisite options like charcuterie, cheese, olives and oysters, while the larger appetizers offer more creative fare. Cider-glazed wings are crispy, salty and sweet, with a marinade of chipotle and brown sugar. A salad of avocado and summer squash is a welcomingly light option, with a green goddess dressing, before the richer entrées. Roast breast of chicken is kept moist under a crisped skin, and served atop a Moroccan-influenced bed of couscous and yogurt, and finished with a few leaves of fried basil. Although thick with the sharp flavors of aged cheddar and caramelized onions, the sizeable TCD burger is dripping in oil, making the entire thing crumble apart after a few bites. Dessert options are limited, but included a dense and creamy horchata-soaked almond cake that is worth trying. Artisan beers and wines --- skewing toward a drier style --- are on offer, with a balance between foreign and domestic.